The city of Tacoma is known for its putrid smell, dubbed the "Aroma of Tacoma". The "Aroma of Tacoma", also known as the Tacoma Aroma, is a putrid and unpleasant odor associated with Tacoma, Washington. Tacoma is located in the western part of the state, in Pierce County. The smell has been described as similar to the odor of rotten eggs. The odor is not noticeable throughout the city, but is rather concentrated in the Tacoma Tideflats and is frequently smelled by motorists traveling that section of Interstate 5. A variety of causes have been attributed to the Aroma of Tacoma, including sediment in Commencement Bay, sulfur released from the Simpson Tacoma Kraft pulp and paper mill, a rendering plant, the U.S. Oil refinery, or a combination of all of these factors. In 1997, the odor was exacerbated for several weeks after municipal officials unsealed a sewage tank that had not been opened in 15 years during the height of a stretch of humid weather. By the early 2000s, the odor had been lessened, but not eliminated, after the Tacoma Kraft pulp and paper mill installed new combustion technologies. The Aroma of Tacoma has been cited as the reason behind jokes about Tacoma once frequently made by residents elsewhere in Western Washington. Research in 2003 suggested the Aroma of Tacoma had contributed to a long-term depression of housing prices in the city. Journalist and author Timothy Egan called it "one of the longest lasting nicknames in the Pacific Northwest" and used it as an example of the many consequences of environmental destruction along Puget Sound. During a concert stop at the Tacoma Dome in the mid 1980s, Bruce Springsteen reported the odor was so overwhelming that he was forced to leave town early. A local doctor said the noxious fumes were unhealthful. The EPA said the smell was due to total reduced sulfur (TRS) emitted by the downtown paper mill (1.5 miles (2.4 km) from the Tacoma Dome). In the 1960s, Jim Torrence and Don Lemon with Diamond Jim and the Jazzmasters released a 45 rpm novelty single titled The Aroma of Tacoma. A rugby tournament held since the 1970s is called the "Tacoma Aroma", as well as a hip-hop band from the Tacoma area. The Pacific Science Center held a symposium called "The science behind Tacoma's Aroma" in 2011. The 1979 Frank Zappa song "Jewish Princess" mentions a "garlic aroma that could level Tacoma". ^ Sailor, Craig (December 12, 2011). "The science behind Tacoma's Aroma". Tacoma News Tribune. Retrieved March 13, 2014. ^ a b c d Egan, Timothy (April 3, 1988). "Tacoma Journal; On Good Days, the Smell Can Hardly Be Noticed". New York Times. Retrieved March 13, 2014. ^ Balzar, John (September 30, 1991). "Residents aim to sweeten the aroma of Tacoma". Los Angeles Times. Retrieved March 14, 2014. ^ Crowley, Walt. "Tacoma - Thumbnail History". HistoryLink. HistoryInk. Retrieved March 17, 2015. ^ Mapes, Lynda (September 6, 1997). "A New Scent For Tacoma's Aroma". Spokesman-Review. Retrieved March 17, 2015. ^ Shaw, Monica (July 1, 2003). "Simpson Tacoma Kraft Reaps Rewards from Recovery Boiler and Precipitator Upgrades". Pulp and Paper Magazine. ^ Samson, Karl (2004). Frommer's Washington. John Wiley & Sons. p. 201. ^ McMillen, Daniel P.; Thorsnes, Paul (2003). "The Aroma of Tacoma: Time-Varying Average Derivatives and the Effect of a Superfund Site on House Prices". Journal of Business & Economic Statistics. 21 (2): 237–246. doi:10.1198/073500103288618927. ^ Timothy Egan (1990). The Good Rain: Across Time and Terrain in the Pacific Northwest. Vintage Departures. p. 129. ISBN 9780679734857. 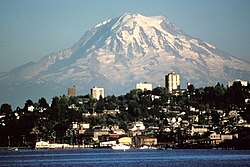 ^ a b c "EPA lists air as unhealthful: Complaints cite "Tacoma Aroma"". Associated Press. April 1, 1985. p. 3C. Retrieved August 19, 2015 – via Google News Archive. ^ "Tacoma's Aroma May Be Doomed". Reading Eagle. Reading, Pennsylvania. Associated Press. June 14, 1972. p. 61. Retrieved August 19, 2015 – via Google News Archive. ^ Larry Mizell Jr. (December 10, 2010). "Tacoma's 2010 In Hiphop". The Stranger. Retrieved August 19, 2015. ^ Craig Sailor (December 12, 2011). "The science behind Tacoma's Aroma". The News Tribune. Tacoma, Washington. Retrieved August 19, 2015. Sullivan, Marianne (2014). "City of Destiny, City of Smoke". Tainted Earth: Smelters, Public Health, and the Environment. Rutgers University Press. pp. 32ff. ISBN 0813570921. This page was last edited on 20 February 2019, at 23:55 (UTC).